ZeroHedge.com is out today with a piece about the explosion of social security disability and what lawyers are getting in fees. Here is a snippet and you can read the rest here. Attorneys took in $1.2 billion in such fees in 2013, up from just $425 million in 2011. 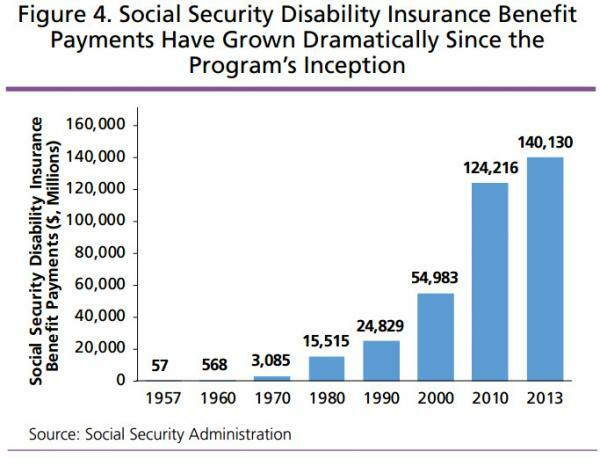 Here is a graph showing the explosion of SSDI recepients. Charles Blahous of the Manhattan Institutue recently reported on some findings from the July 28th Social Security Trustees annual report. Social Security and Medicare are two government programs that have been long embedded in government spending. These programs are political hot topics whenever they are suggested to be “reformed” or made more efficient, political dogma ensues. Changes for the most part of these programs are made to give MORE benefits to people and not a regression. I will take some information from Mr. Blahous write up which he did testify in front of Congress about and then turn to two other sources for completion of this summary. Social Security has two trust funds. Payments for retired workers as well as spouses, children and survivors are made from the Old-Age and Survivors (OASI) trust fund. Payments for disabled workers and their dependents are made from the Disability Insurance (DI) trust fund. It has become commonplace to refer to the two trust funds’ combined operations as though they were one fund. This nomenclature is convenient but not truly accurate. By law each of the two trust funds must separately have a positive balance to allow them to make benefit payments. Here is big point for people to grasp about this trust fund. Many people who support Social Security at any cost claim the program has too by “law” go on forever no matter what funding issues arise. That is true to a point and here is that BIG point. Once funding for the SS Disability Insurance fund starts going in the red, payments can be greatly reduced “BY LAW”. The trustees have been warning for several years (long before I became one) that Social Security is on an unsustainable financial trajectory. We have now moved from a long-term problem to an immediate one. The DI trust fund is currently projected to be depleted in two years, in the fourth quarter of 2016. At that point, unless the law is changed disability payments will drop suddenly by 19 percent. I would suggest reading Charles Blahous article (A Guide to the 2014 Social Security Trustees Report) a few times and even take some time to ponder it. It is a very nice write up and one to keep on file for further events. Social Security and Medicare produce reports and the federal government then puts together a summary(Status of the Social Security and Medicare Programs) of these two reports. Here are some highlights of the summary pertaining to just Social Security. In October 2013, “60 Minutes” reporter Steve Kroft did a segment called “Disability, USA”. If you have not seen it, I suggest you take a look at the SS disability situation happening in America. Final summation: For years many Austrian Economic students have talked about the Social Security situation. They are usually met with resistance by economic pundits who produce wild and complicated graphs that say everything is o.k. Problem with this belief is it defies reality. Real money is being given to real people. This program has real issues that cannot be delayed as the physics of debt take over.